The Peppa Pig Artist Pad is perfect for all Peppa Pig fans and is ideal for encouraging your child’s imagination and creativity and with over 50 reusable stickers and crayons included they will have hours of fun colouring in and creating scenes…. This toy costs approximately £4.99 (for the latest and best prices make sure you check our retailer list for the Peppa Pig Artist Pad above). 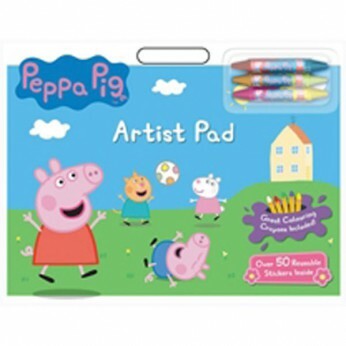 In our review of Peppa Pig Artist Pad we classed it as being suitable for ages 3 years, 4 years, 5 years but recommend you check the manufacturer specific advice before purchasing.